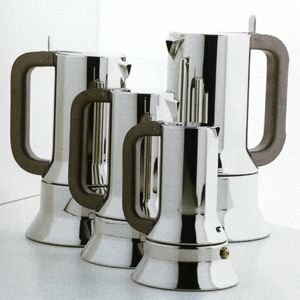 Alessi Caffettiera Espresso Coffee Maker - 9090 Magnum This coffee maker is sleek & sophiscated in design - a must have for any kitchen. Just think of the aroma wafting up the stairs on those week day mornings to give you coffee lovers that all important boost. Made from Highly Polished Stainless Steel, it will add a touch of style to any home. Would make an ideal gift. Holds 10 cups Designer: Richard Sapper. Capacity:50cl Dimensions: h23.5cm d14.5cm Comes Boxed.